Lastek takes laser safety seriously, and we know you do too. That's why we're committed to assisting our customers in ensuring all necessary and appropriate safety measures are available and in place. We offer comprehensive advice and support, and can even assist with a laser safety audit for your facility. With suppliers like Lasermet, Yamamoto, Thorlabs and Gentex we can help you with virtually all your safety requirements, including eye protection, shutters, laser blocking curtains/blinds and complete safety interlock systems. Visit our dedicated laser safety website at www.lasersafetyaustralia.com.au. Explore below the full list of laser safety companies whom we represent, or contact us for assistance with your specific needs. We love to talk laser safety so give us a call today! Lastek offers a complete range of laser protective eyewear from supplies such as; NoIR, Laservision, Yamamoto, Thorlabs, Offenhaeuser + Berger, and others. Produced by GL Services in association with Lasermet Ltd, this is an ideal package for Laser Safety Officers or anyone else who regularly performs risk assessments on lasers or LEDs. According with all the relevant standards, (see below), it will save you hours of work and give consistent and correct answers to your calculations of MPEs, AELs, accessible emission, optical density requirements, classification etc. Because it performs in seconds, calculations which used to take hours, you can easily explore the safety of different scenarios for your laser or laser system. LaserSafe PC is by far the most comprehensive and widely used laser safety software available, with extensive use by major companies, government institutions and Universities. All Class 3B and Class 4 lasers require interlocking to comply with standard laser safety practice. However, while this fulfills the safety requirements it can be annoying and even costly to have your laser shut down when an access door is opened. Such interruptions can be avoided either by using a locking interlock system (see Interlock section), or by providing accurate information regarding your laser status by the use of illuminated signs, or both. Choose between Mains Powered Fluorescent Signs and Low Voltage LED Signs shown above. Lasermet Interlock Systems enable organisations to comply with best practice when providing laser users with a safe environment in which to operate hazardous lasers. Designed for maximum safety and efficiency, these Interlock Systems are configured to provide automatic shut-off of the laser beam if safety doors, covers or blinds are opened. The LS- range of laser beam shutters are combined shutters and beam dumps designed to be driven by a safety control system such as Lasermet laser interlock control systems, for use as a means of shutting down the laser beam automatically during unauthorised access, or manually when the beam is not required. They can also be used as stand alone shutters for manual or remote switching of the beam, or are available as OEM components for laser or laser product manufacturers. Lasermet Laser-Blocking Roller Blinds are made from the same Lasermet laser-blocking material as the curtains and are made-to-measure to fit any size of window. They are available as standard or encapsulated options. Lasermet supply and install Class 1 room size laser enclosures for high power lasers. All enclosures are sold tested and certified to EN 60825-4 (Safety of Laser Products Part 4 - Laser Guards). These can be supplied complete with interlock system and illuminated signs. Fume extraction and/or air conditioning can also be supplied, as can CCTV. This is a cost effective and extremely easy method of enclosing your laser system which fulfils your safety requirements and frees up space for other activities. The Laser-Blocking Curtains Lastek supplies is made by Lasermet using their specially-developed laser-blocking material. Not only does the fire-proof curtain operate as a laser-blocking screen but also as a blackout screen. Both sides of the material will block laser radiation, but if the white side is used as the laser-blocking side a higher laser blocking specification is achieved making the curtain suitable for higher power lasers. Standard screens are made from a laser-blocking material which has been specially developed for laser safety by Lasermet, This can be supplied off the roll or as ready-made ceiling or wall-mounted curtains, roller blinds, window blocks or free standing screens and enclosures. Also available are heavy-duty screens for high power, multi-kilowatt materials-processing lasers. These are made from a 50 mm thick sandwich of steel and a special lightweight laser-blocking material. Laservision offer a comprehensive selection of laser safety eyewear, filters, windows and more. NoIR--an independent manufacturer and eye-protection specialist--has been providing medical and industrial safety eyewear since 1973 to a global community of laser manufacturers, medical and industrial UV/blue light system manufacturers, hospitals, clinicians and pharmaceutical and telelcommunication companies. Custom frequency absorption, alignment, UV/Blue light curing, photodynamic therapy, and enhancement filters are available. For full details of available models including frames and filters please visit NoIR LaserShield at Laser Safety Australia. Glendale's Laser Glass Technology (LGT) is designed to withstand direct laser radiation for short durations. Absorbing glass, dielectrics and self-healing plastics are combined to maximize visibility and weight and to provide impact resistance. For the ultimate in comfort and wearability, eliminate the need to fit laser protection over your Rx glasses with Glendale's prescription laser eyewear. All products are manufactured Glendale's in-house optical lab. Please contact our sales staff for help in selecting the appropriate eyewear. Glendale offers a broad range of LGT, Polymer and prescription laser protection eyewear to meet all your safety needs. 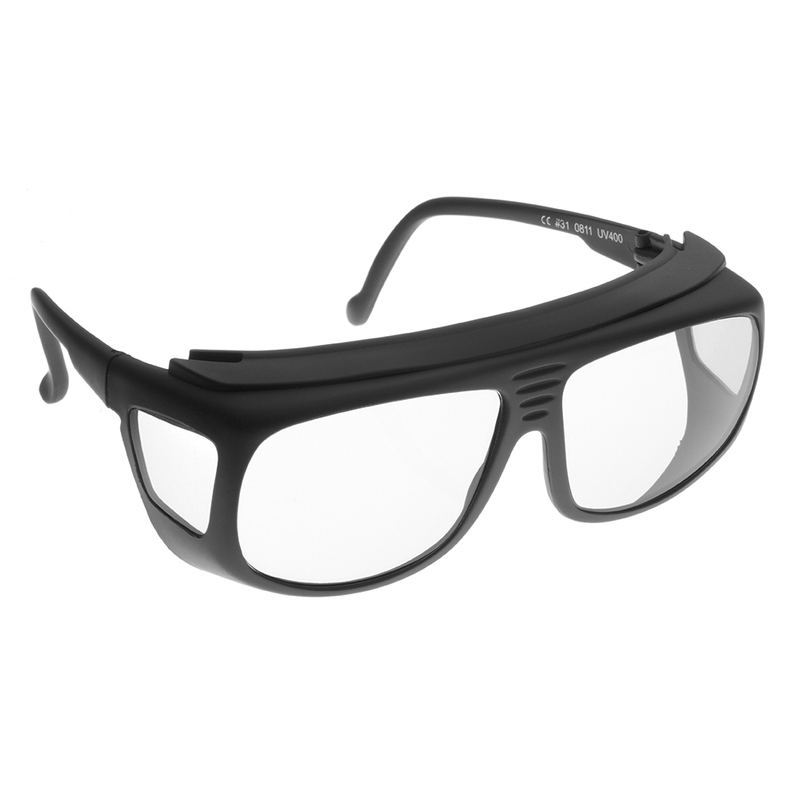 Their LGT (laser glass technology) is designed to withstand direct laser radiation for short durations. Absorbing glass, dielectrics and self-healing plastics are combined to maximize visibility and weight and to provide impact resistance. Lastek offers a complete range of laser protective eyewear from supplies including NoIR, Yamamoto, Thorlabs, Glendale/Sperian, Offenhaeuser + Berger and others. Offenhaeuser+Berger manufactures high quality eyewear with some of the highest ratings available. The LG series of laser safety glasses provide CE certified laser radiation protection. The comfortable frame style can be used over the top of prescription lenses and has top and side shields to protect the user's eyes from peripheral laser radiation. The interior dimensions of the LG series of laser goggles are 145 mm x 53 mm and have a 140 mm temple. The lenses have a diagonal length of 68 mm. Each pair of laser safety glasses comes with a protective storage case, a slip on neck strap, and a cleaning cloth.